Park entry fees apply if you're parking in Royal National Park. Wedding Cake Rock is unstable and has a fence around it for your safety. Please stay behind the fenced off areas. Standing or sitting on the rock or cliff edges poses a very high safety risk. This is a beautiful location and we encourage people to come and look at the spectacular rock formations and take photos–but the key is to enjoy the views from a safe distance. The walking track to Wedding Cake Rock is rough and often steep and rocky. Remember to wear appropriate footwear and clothing, and allow at least 1 hour each way from Bundeena. Phone reception on the track is limited. In an emergency, ring 000. During total fire bans, the track to Wedding Cake Rock is closed. Check alerts and closures for Royal National Park before you visit. It's a good idea to visit toilet facilities before starting your journey, and carry enough food and drinking water for the return trip. 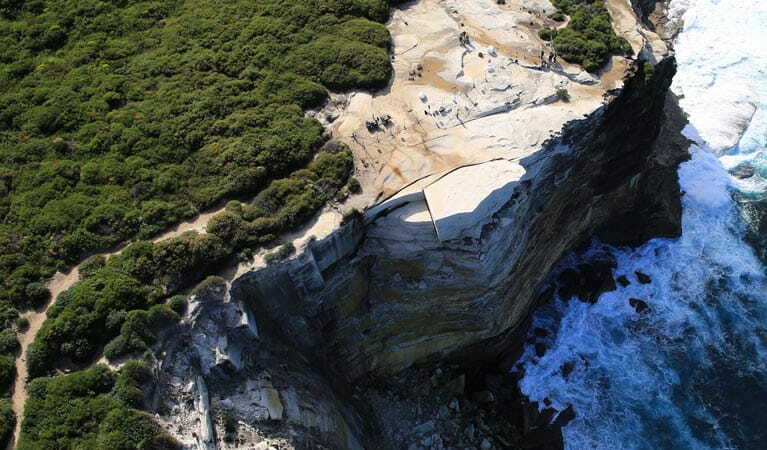 Located around 1 hour's walk south of Bundeena, Wedding Cake Rock is a highlight along the famous Coast track. The pure white rock stands out against the harder sandstone of the coastal cliffs - its sharp edges and deep cracks giving it a unique shape, like a slice of cake perched high above the pounding ocean. 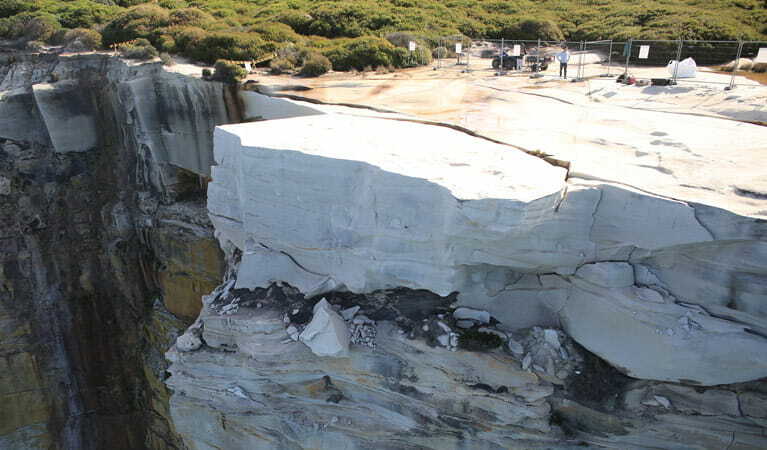 The white colour is caused by iron leaching, which makes the sandstone layers dangerously soft, prone to cracking and at very high risk of collapse. For your safety, please don't stand or sit on the rock, or venture too close to cliff edges. Getting there is half the adventure, as you tackle the steep and rocky track through coastal heathland, home to spring wildflowers, swamp wallabies and birdlife. The track traces the coastal cliffs, offering sweeping ocean views perfect for whale watching - and plenty of vantage points to take incredible photos of Wedding Cake Rock without compromising your safety. 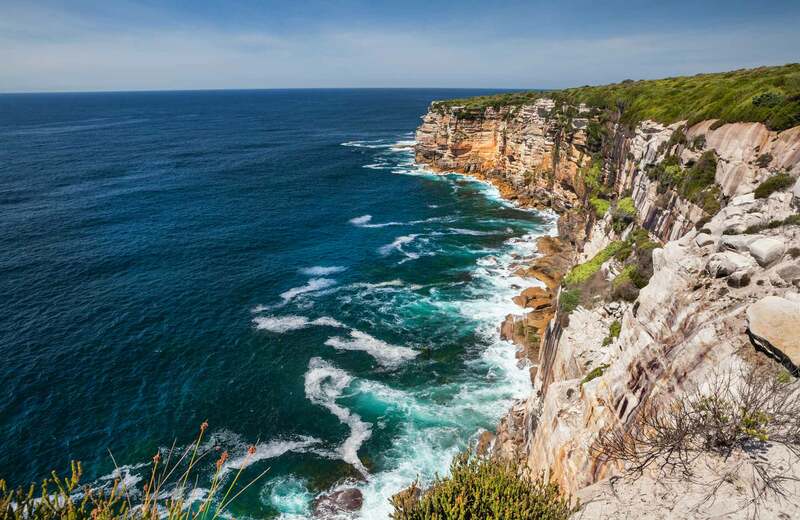 On your way home, return along the track to Bundeena, or continue past Wedding Cake Rock down to Marley Beach.